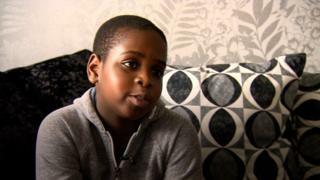 A 10-year-old boy says he is "too scared" to walk to school after racist graffiti was daubed outside his home. David Yamba found "No Blacks" painted on three doors in his block of flats in Salford on 8 February, five days after his family had moved in. His father Jackson reported it to Greater Manchester Police on the same day but said on Saturday they "still haven't been here to investigate". The force has since apologised and said it would review its approach. Recalling when he found the graffiti before going to school, David said: "I started crying because I thought that something was going to happen to me or they may have been waiting there. "I got frightened and I was holding my dad's shirt because… I didn't want to get hurt." "I kept asking my daddy was the police going to arrive yet." His father Jackson, who is training to become a lawyer, said the police worker who took his call was "quite nice [...] she told me that they would be sending someone over". But he said there was then "no phone call, no visit, nothing at all" until he tweeted about it on Saturday night. Responding to Mr Yamba's posts, GMP chief constable Ian Hopkins apologised on Twitter, saying: "That is frankly just not good enough. There may have been other issues at the time, but we should have followed up quickly. It's an appalling crime you and your family have suffered." Jackson, I have only just seen this and can only apologise. I have asked the duty Assistant Chief Constable to ensure we visit you and investigate immediately. I have asked for a personal update as to Why we haven't done so to date. Adding there had been "104 open incidents in Salford that morning", he wrote: "It was dealt with on the telephone initially in agreement with the victim. It is after that we have failed to follow up quickly enough." Ch Insp David Gilbride, who visited Mr Yamba at his flat on Sunday, said: "This is an abhorrent crime and there is no room for hatred and prejudice in our society. "We always strive to provide the best possible service to the public that we can, and provide an appropriate and expedient response. "Where we fall short of this, we will review our approach and look to learn from it." The Home Office said the increase was "thought to be largely driven by improvements in police recording, although there has been spikes in hate crime following certain events such as the EU Referendum and the terrorist attacks in 2017"
Ch Insp Gilbride appealed for information, saying he would ensure this incident was "fully investigated as a hate crime". Andy Burnham, mayor of Greater Manchester, tweeted: "This has no place whatsoever in Greater Manchester. Glad GMP investigating but Chief Constable right to inquire why this wasn't done sooner."